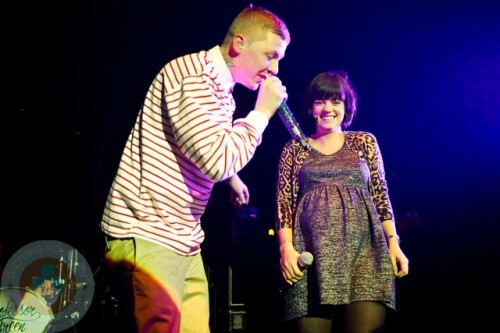 An expectant Lily Allen made a surprise appearance on stage last night when she joined Professor Green to perform his Top 10 hit ‘Just Be Good To Green’ – the song she originally featured on. Lily’s pregnancy was barely evident as she strutted around the stage in a flirty above the knee dress and platform heals. It’s good to see that she’s not letting it slow her down! The new baby, who is the first for Lily and her boyfriend Sam Cooper, is reportedly due around the new year. Lance Armstrong Welcomes 5th Child, Tweets Pic! Alicia Keys And Swizz Beatz Welcome A Baby Boy! Matt and Luciana Damon Enjoy A Pre-Baby Date Night!